It had happened. A bleed. A big one. I was taken to the hospital by ambulance. I think that I have never been nearer to a complete breakdown than I was that night in the ER. Why a bleed now? Even if she had had enough opiates to cloud her memory, my last memory of my mother will be this: not being there for her. 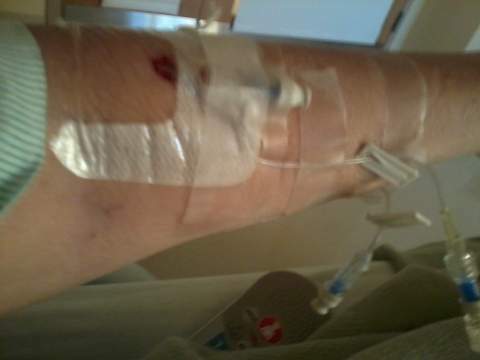 The usual thing, the IV’s, the history, the whole admissions rigmarole proceeded. I told the GI on call that night if I wasn’t going to be scoped in the morning when there may still be a chance of finding the source of the bleed, that I wouldn’t consent at all to an upper endoscopy. The gastroenterologists here have repeatedly delayed up to twenty hours between the start of a bleed and their looking for its source, and then are surprised when they find none. A bleed can stop on its own, and the IV medications, as I have explained before, aid this. I was taken for the endoscopy at 8:30 or so in the morning. When I was returned to the room, my husband was there. He had his news, and I had mine. His presence was enough to tell me what his was: my mother was dead. Mine? The GI who did the endoscopy said that what she had seen was something she could not fix, and neither could her colleagues. I needed to get to a teaching hospital as soon as possible. I had a stray blood vessel resting over two large varices. Normally, if I understood her correctly, this vessel could have been cauterized, but as it was positioned, there was a risk of burning through the vessel and into my varices, causing a massive bleed. Things had gone for bad to worse. I was too distressed to be surprised, quite frankly. So we got in contact with my hepatologist at the University of Alabama in Birmingham about six hours away, and an appointment was set so that he could have a look for himself first thing Monday morning. 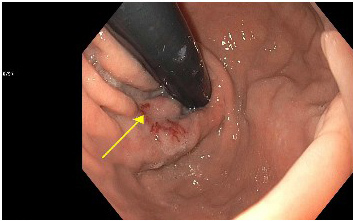 Here are the pictures from the July 9 endoscopy clearly showing the problem in my esophagus. I think the doctor said the purple things were large varices that couldn’t be banded because of the blood vessel that couldn’t be cauterized because of its position. In my next post, I’ll explain how things got worse — again. PBC Bleed 7. The Vesuvius Within Me. Crashing in the Same Car. Good thing I finally got around this month to describing November’s bleeds 5 and 6 in this continuing realtime account of me and my PBC (primary biliary cirrhosis) because now it’s already time to move along to bleed 7. This was a rather dramatic one, occurring in the wee hours of January 18, 2013. My hemoglobin [hgb] dropped to a personal worst of 6.1, I landed in the ICU and then on the cardiology floor, and required 3 transfusions. A couple of days ago my hgb was 10.5, mildly anemic, but I feel great. Why the ICU and cardio unit? Because when your hemoglobin drops that low (normal for post-menopausal women = 11.7 to 13.8), it means none of your organs — including your heart — are getting enough oxygen. What went right this time was that the Asheville ER got a gastroenterologist in to perform an endoscopy immediately, while I was still actively bleeding. Except for my first bleed, in Huntsville the doctors waited 20 hours or more to ‘scope, after drugs and IV fluids had stopped the bleeding. You can’t be sure of the source of the bleed if you don’t see the bleed. Now as it happened, I had an endoscopy and visit planned with my hepatologist, Dr. Brendan McGuire, at University of Alabama-Birmingham’s Liver Center for January 22 and 23. So immediately after leaving the hospital on the 21st, we headed south. Dr. McGuire scoped me Tuesday morning and reported he agreed with the Asheville doctors. He described the area as not unlike a scrape on a kid’s knee that scabs over, but before it gets a chance to heal completely, keeps getting banged up. He didn’t see the site of my first bleed until a few weeks had passed but thinks this one was in its vicinity if not the same place. So it could be like I keep crashing in the same car, having the same bleed over and again. Since I wasn’t scoped during bleeds 2 through 6, we’ll never know. Why not fix the hiatal hernia? Too risky: its position, the sites of the erosion and varices, the amount of scar tissue, the thinness of the veins — lots of reasons. What can be done: double the dose of beta blockers I’m taking to slow heartbeat and of antacids to reduce stomach erosion. And hope that the Vesuvius within me remains dormant. And what about my primary biliary cirrhosis? I’m doing just fine there, holding fairly stable. It could be years and years before it is bad enough to warrant a transplant. There is something called a MELD score. Normal people’s is zero. Those near dead of liver failure have a score of 40. I’m at 8. Bleeds don’t factor in. So all I have to do is hope I don’t erupt. But what we need now is a little relief from the dreariness of reading about me going on about vomiting blood. You can choose between this one with a particularly happy Bowie, or the GQ Awards show where Bowie wore sandals with socks, or this with a sassy Bowie around 3:18. Or all and more (like here, where he isn’t playing the guitar and seems not to know what to do with his arms). PS: Although it doesn’t have much about PBC, this site has a cool diagram of possible diagnoses related to liver trouble. PBC, Bleeding Varices. Bleeds 5 and 5.5. Or 6. 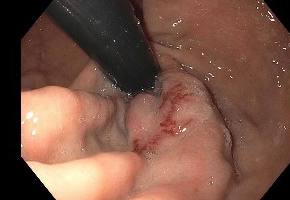 Yes, it has been months since I last posted, and, yes, my next-to-last post was on this same topic (Primary Biliary Cirrhosis [PBC], Portal Hypertension, My Perfect Endoscopy Results and My Fourth Bleed) in my continuing series of what my experience with PBC is like. I’m beginning to understand why there aren’t so many real-time chronicles of progressively worsening illnesses. 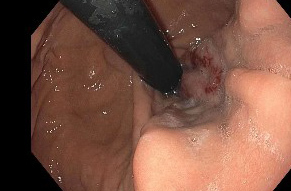 You may recall that back in early October 2012, I had a routine exploratory endoscopy with perfect results, followed a few days later by a bleed I was told was from a tear in the esophagus which was patched up, and no other problems noted. November 6 I drove from Asheville, NC back to Huntsville, AL to spend the 8th with my son on his 23rd birthday. Before dawn on the 8th I started throwing up and defecating black blood. I really, really did not want to go to the hospital. I didn’t want to ruin my son’s birthday. I had so looked forward to this. But even less did I want him to discover me bled out, so I told him, and he insisted I go to the hospital. We ended up visiting in a room of the same hospital where we were 23 years previously, to the day. Next day, the 9th, another endoscopy. 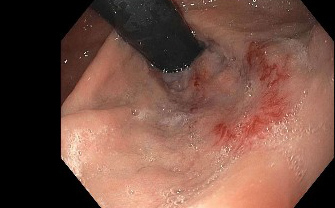 And behold, the GI discovers two varices needing banding. He also reports that he saw no evidence of the tear I was told was the cause of my October 5 bleed, with repeated emphasis on the word tear. Huntsville GI added he wasn’t impressed with the Asheville GI’s work and that I had a good deal of scar tissue. Because my hemoglobin creeps up to 9 (12 is normal lower limit), I’m not transfused and am released that day. Between November 8 and November 20, I felt worse and worse, like I was practicing being dead. I didn’t read or write or sleep, just stared out the window. I was with my daughter at her doctor’s on the 20th when I started throwing up blood. Again. This time was a bit different; t some red mixed in there with the black, not quite as much as in past bleeds, but enough so I am on the verge of losing consciousness. It was two days before Thanksgiving, and I had really, really been looking forward to spending it with my family and new friends. The GI on call from the practice I visited to schedule October’s exploratory endoscopy paid me a visit in the ER. This made the sixth I’d seen from that practice. I never will believe that I had a spontaneous tear after the exploratory and not a nick, but GI #6 is simply preposterous. He claims that with PBC patients, low hemoglobin, as low as 8, is preferable to the normal 12-14 because less blood means less likelihood of portal hypertension. How stupid does this man think I am? He’s the doctor and I am not so I refrained from telling him his job or the role of oxygenated blood in maintaining life. But man, why don’t we just take a few pints of your blood, drop you to 8, and then let’s discuss quality of life. Fortunately, a new GI did the next day’s endoscopy. She reported that I didn’t have varices that bled. Instead, the bleeding was caused by ulcerations around the two bands placed by the Huntsville GI (who was, you’ll recall, unimpressed by the Asheville group’s work). So was this Bleed 5.5 or Bleed 6? It wasn’t a varices bleed. But then again, neither was Bleed 4 (the nick bleed). There was a good thing about Bleed 5.5 or 6. It got me some blood. My hemoglobin had dipped to 6.7, an all-time personal worst for me. I thought after the doctor visited Thanksgiving morning that I would be able to go home when the second transfusion ended. But a nurse said it would take 12 hours to wean me off the IV which was delivering a drug to help stop internal bleeding. Despair. In comes Thanksgiving Day hospital turkey. However, when the hospitalist came around, she said since this was not a varices bleed, I didn’t need to be on that drug, and so didn’t need to be weaned from it. I could leave. No one can give me an answer beyond bad luck for how in hell two varices burst on November 8 when on October 2 and 5, there were no signs of developing varices. I’m going to Birmingham to see my hepatologist at UAB in 10 days. It is worth it to me to drive 6 hours for an exploratory endoscopy with someone I trust. Thanksgiving 2012. My left arm. The other looked about the same.